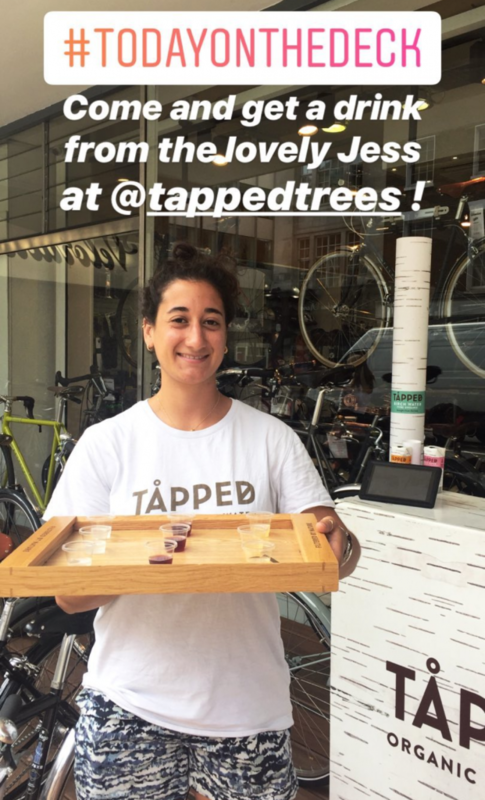 This entry was posted in News, Events on 17th October 2018 by Maud de Rohan Willner. For 38 years I have worked as a barrister in criminal defence and although it's often gruelling I will probably keep doing it until I drop. To say one meets interesting people in my work is an understatement. In particular, alleged murderers and terrorists, all have sad and o en tragic stories to tell. I have learnt when dealing with such complex lives that almost no one is simply good or bad. I am passionate about my work. Making sure that people get a fair trial. This means leaving no stone unturned. But my life would have no real meaning without my husband Bobby. Together for 30 years now. We spend 3 months of the year in our farmhouse in Italy, which we are both passionate about. I have been an off-and-on cyclist since childhood. In my teens I was a gymnast and found that cycling up and down the hills from school to home was a natural way to keep fit. 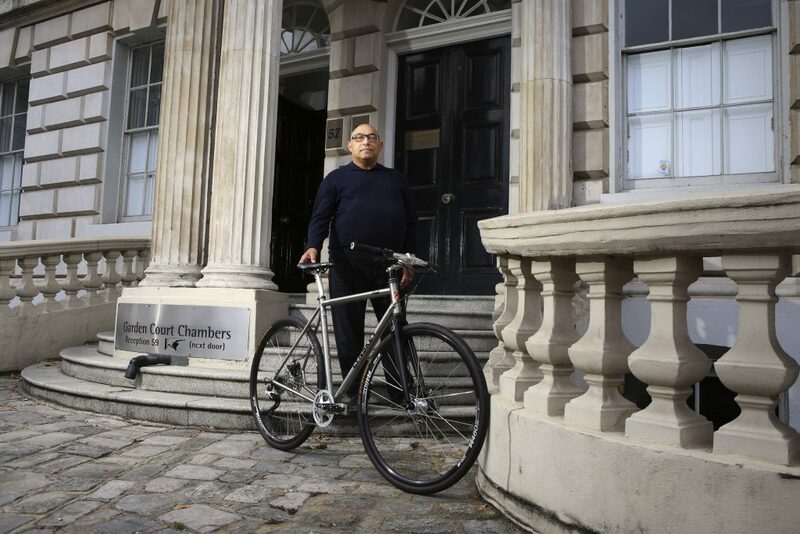 have become much more of a keen cyclist in recent years and now see it as my main form of transport in London, when I do not have too many books and papers to lug around. It is a good way to get exercise when your job involves hours at a desk or in court. Much more pleasure and utilitarian than going to the gym. How often do you ride and where? My daily route is to and from Dalston, where I live, then to the Old Bailey and my chambers in Lincolnns nn fields. When have time I stop at Ironmonger Row baths for a swim. 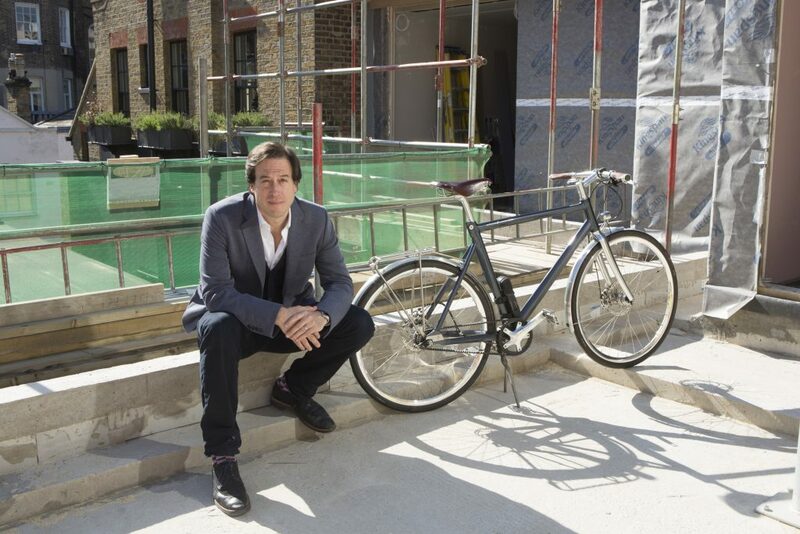 Bobby and I try and cycle for pleasure, down the canal, through Victoria Park to the Olympic Park is a favourite. In Italy we have a couple of bikes that we sometimes take to the beach near Senigallia. After a quick spin round the market, maybe picking up a few peaches, we cycle 13 kilometres down the coast road and back up again. We turn round and cycle back, stopping for a swim on the way. Twenty-six kilometres - flat but hot! 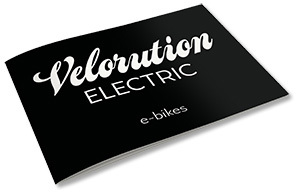 This entry was posted in Velorutionaries on 11th October 2018 by Maud de Rohan Willner. I have been enjoying my retirement for 10 years. Previously I was a carer for an elderly friend and before that I did clerical work. I have always been really sporty participating in lots of active team games like rounders, tennis, netball and hockey, which I played until I was 45years old. 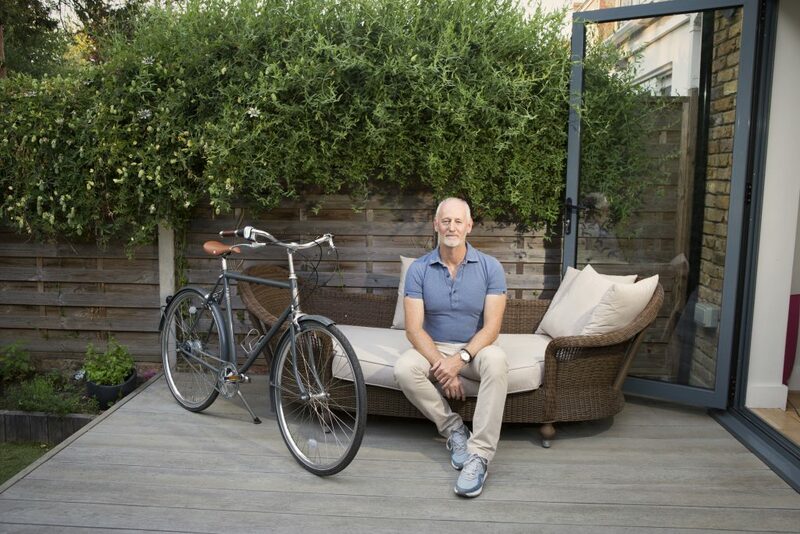 Cycling has always been a part of my life, plus swimming and our fun skiing holidays. 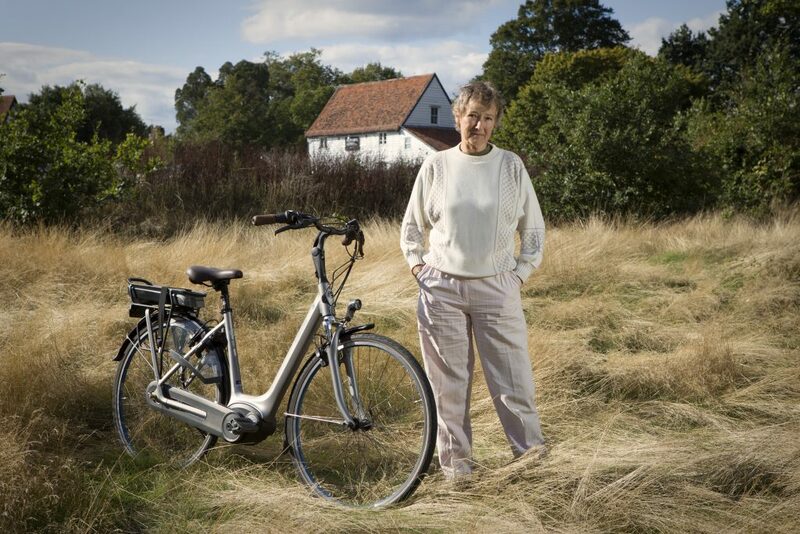 I had problems with my knees and they had to be replaced hence the move to an electric bike. I learned to ride when I was 10 years old. My aDd had to fit blocks onto the pedals because my legs were not long enough to reach them. It was a 24-inch boy’s bike, so I had to swing my leg over the saddle. This bike belonged to my elder brother before me, and was then passed down in turn to the other two. My youngest brother is 10 years younger than me so I would put on my roller skates to keep up with him as he learned to ride. Fun times! 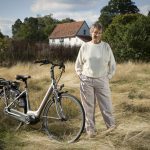 After we had our bikes stolen, and in part because I had the knee replacements plus we are both getting older, we decided to go for it and buy two lovely new e-bikes. I have chosen a Gazelle Orange C7 HMB which has a comfortable saddle and nicely rounded handlebars that have been adjusted so I can ride in a more upright cycling position. As much as possible. I am going to ride much more on my new electric Gazelle. I like the freedom of cycling. I mainly cycled to work as it was convenient and quicker than public transport, I could take the side roads and short cuts, avoiding the traffic and pollution. also used to ride to the local market for fruit and vegetables, the bags were so stuffed that the poor bike wobbled on its way back home - mostly uphill! 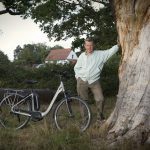 Now we have the advantage of pedal assistance I intend to ride more regularly, either locally in Epping Forest or along the River Lea towpath northwards to Bishops Stortford or south to London and the River Thames picking up all the cycle routes along the way. We have a rack for the car so we will be heading off to pastures new, we may even take the electrics across to the continent. New adventures! I have been retired for some 7 years - how time flies! I worked as a self-employed sales agent selling DIY products to independent retailers and wholesale outlets in London through to East Anglia. One advantage was that I drove through wonderful countryside and villages; the downside is that had insufficient time to explore, and time meant money. Being retired enables me to explore the countryside in my own time as well as enjoying numerous holidays, playing badminton, walking with the local ramblers in Epping Forest on the edge of North East London and Essex. I am involved in Scouting in Hackney, which has its challenges. I was a Games Maker for the 2012 Olympic Games for both the main and paraplegic competitors. 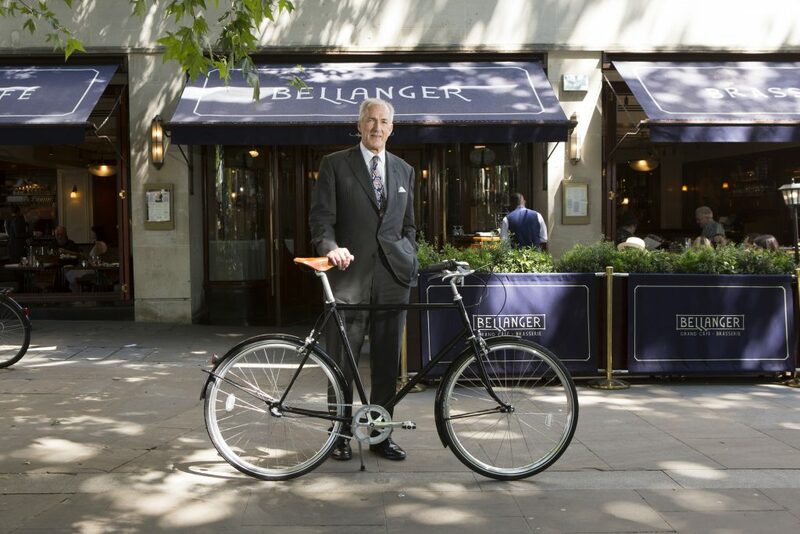 I volunteered for the Prudential Ride London for the last couple of years and saw numerous types of bicycles both in classic and modern designs, there were even a number of electric skateboards! I have enjoyed cycling for many years but have not ventured out on longer journeys. This all stopped when our bicycles were stolen from our garage despite being chained and locked together. 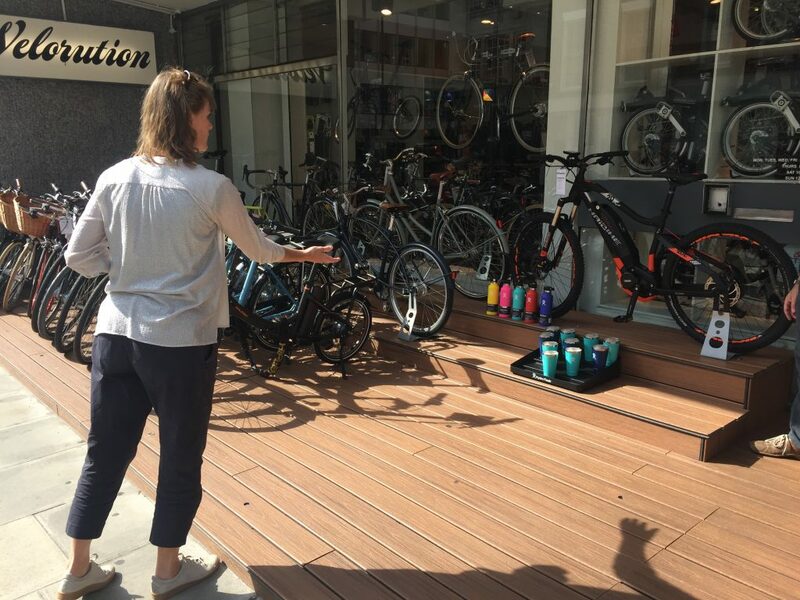 Late last year we decided to look round for replacement bicycles and the possibility of buying electric bikes, as my wife had a test ride on one and was suitably impressed. 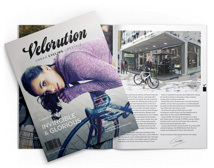 In February 2018 we went to The London Bike Show and had test rides on the track with the Velorution team. 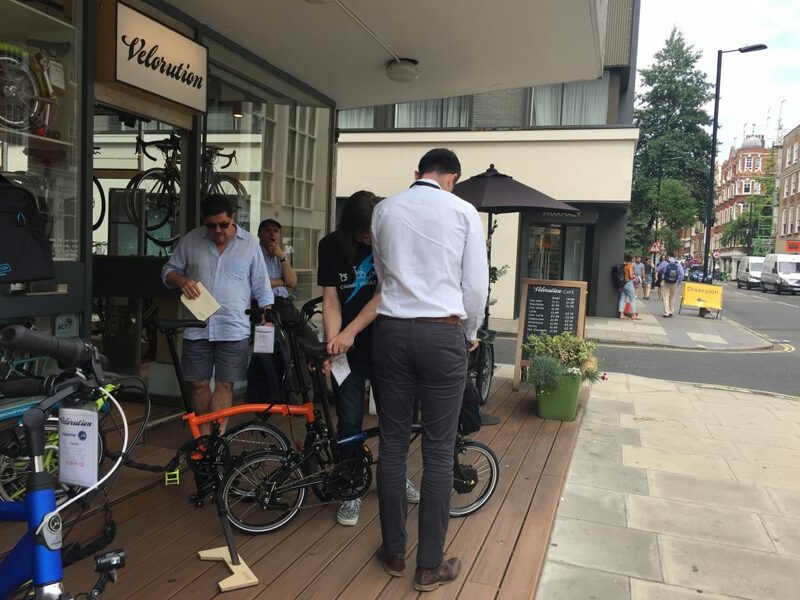 When Velorution Electric opened its doors we were able to try as many bikes as we liked and went on wonderful rides around Regents Park and the neighbouring BBC car park which has a steep ramp in which to test out the various modes. I decided to buy the German-built Kalkhoff Agattu Excite B8 e-bike. 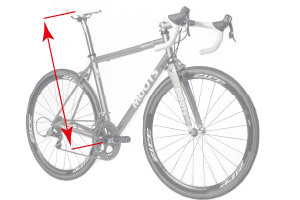 It is an excellent quality bike and really comfortable. We plan to ride every week depending on the weather, but to fit this in, with all our other activities that we retired people do, will need careful planning! Cycling gives you freedom of the road and time to enjoy the country lanes at your own pace. 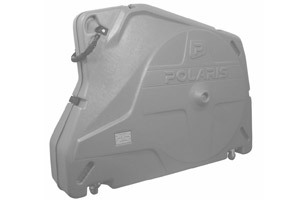 We bought a specialist car rack for the bikes; this will enable us to go further afield. We are considering taking the bikes to Europe and cycling down the empty lanes just like Butch Cassidy! I work for a small leadership training company that supports international clients in developing more conscious and purposeful leaders. Food, film, sport, what makes people tick, beauty and what lies under the surface. 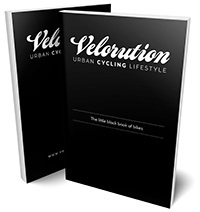 What Velorution bike are you riding? A Pelago Bristol from Finland. I own a really nice racing bike but wanted something classic, beautiful and upright for a more leisurely ride. also have a so spot for Scandinavian design and the Pelago Bristol has a nice mix of comfort beauty and speed. 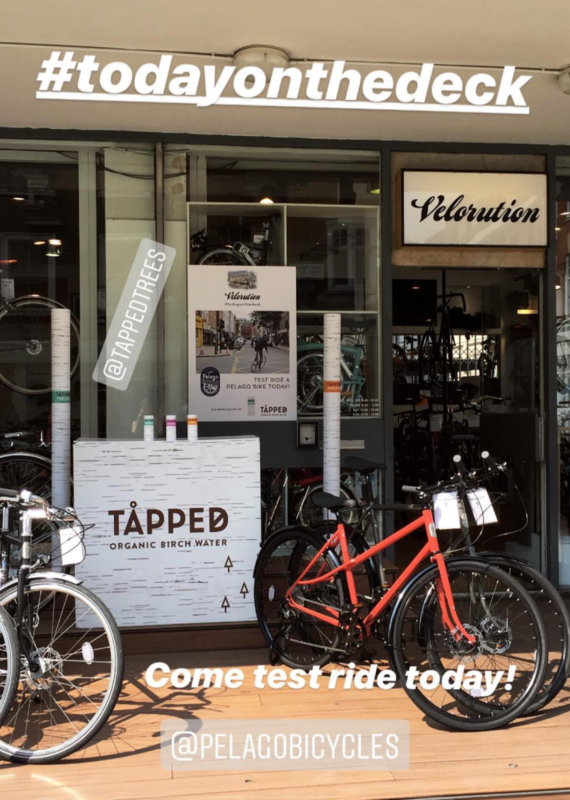 The team at Velorution couldn’t have been more helpful - they are quick to get you on the bikes for test rides, so you get to try them out, and I like that. Movement, speed, wind in your face, seeing places close up and the chance to feel your heart pumping. I ride to my local swimming pool a few times a week - Bushy park , Richmond Park and Box Hill are my local playgrounds. I love the Trail Ridge Road climb over the Rocky Mountain National Park, starting at Grand Lake in Colorado State, the largest natural body of water in Colorado - I have a great picture of a moose at the side of the road - it's a magical place and the views at the top are breathtaking. I work in mergers and acquisitions - advising on buying and selling businesses. n the last twelve months we have sold over one hundred companies around the world. 2018 was a big year for our London o ce as we celebrated our 10th anniversary and a record year. I have a growing art collection. nm passionate about that. try to buy three good paintings a year and must have more than twenty by now. They are all old paintings of farm animals which my friends find a bit odd, but was raised on a farm in the West Country so to me it’s perfectly normal to be surrounded by livestock at home. I’ve always cycled to get around – at home, at university and now work. 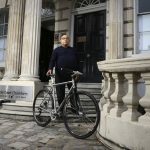 I've been cycling to work pretty much every day since I started my current role ten years ago. It's just under five miles door to door which takes about twenty minutes. That's faster than a taxi, healthy and very efficient. It’s a customised Schindelhauer Ludwig VIII with Gates Carbon Drive. It is the most comfortable bicycle nve ever ridden and replaces a single speed bike with solid tyres and poor brakes. The difference is chalk and cheese. Cycling is great exercise and it's the fastest route for me to commute to and from work. Now am encouraging my 9 year old daughter to cycle as well, we cycle together on the weekends around Clapham. My father always used to cycle with me and my siblings when we were young so it’s nice to continue that tradition. I ride all the time and in all weather – sun, snow, wind and rain. tns a fairly short commuting distance plus I invested in good all weather kit, including excellent dynamo powered lights, so it’s not a problem. 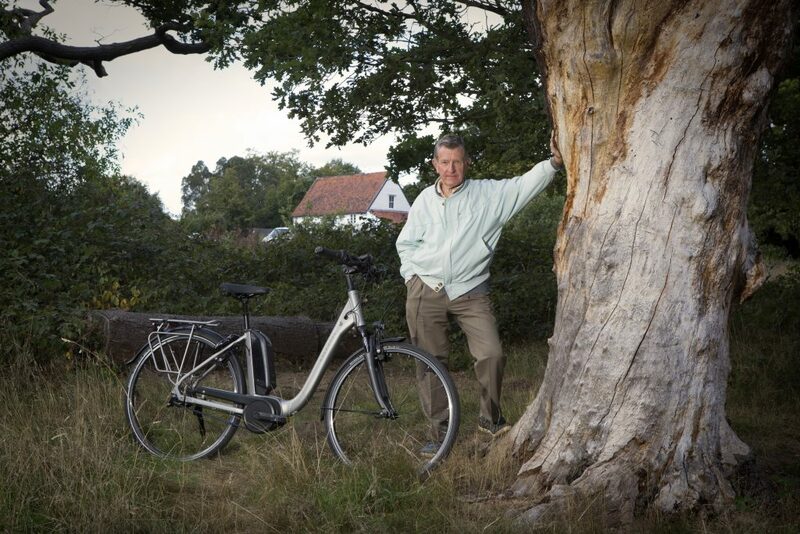 London has some fabulous parks to cycle through – far better than most other cities in the world. Battersea ark is my favourite; it’s on my route home and the two mile carriage drive is ideal for cycling. We arrived in London over a year ago for David’s work supporting the NHS transition to integrated care. We both quickly realised we needed a bike to see this amazing city. What are you both passionate about? We are passionate about our family, especially our three daughters living in the USA, finding the best Indian restaurants in London, theatre and travel. How long have you been cyclists? Although we both rode bikes as kids we decided to take up biking as adults when we challenged ourselves to do a triathlon. Since then we le the competition behind and decided leisure bike riding is more fun. What bikes are you riding and why? 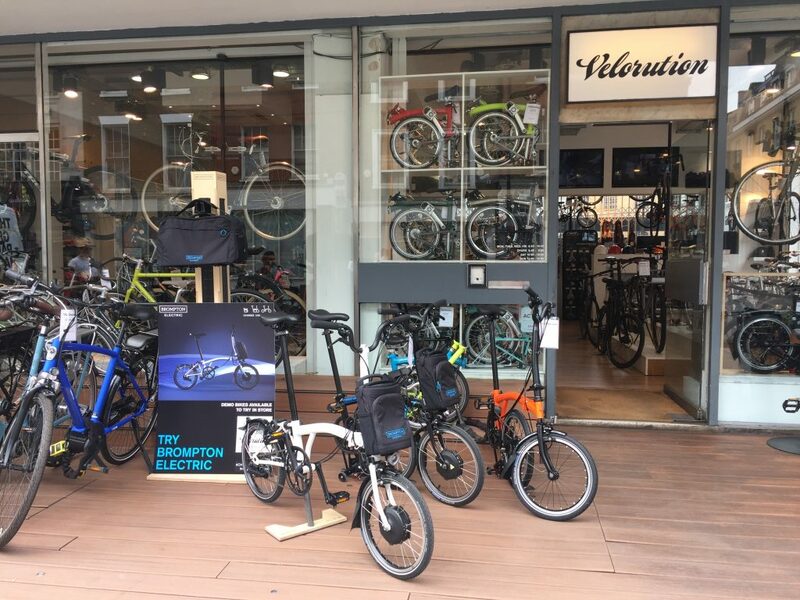 We were walking the neighbourhood and found Velorution, an incredible store where the team focus on helping you find the best bike for your lifestyle. 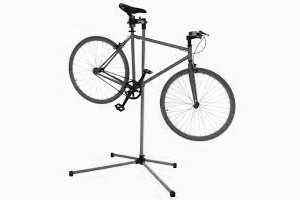 Even better, we became friends and they support you with all your biking needs. 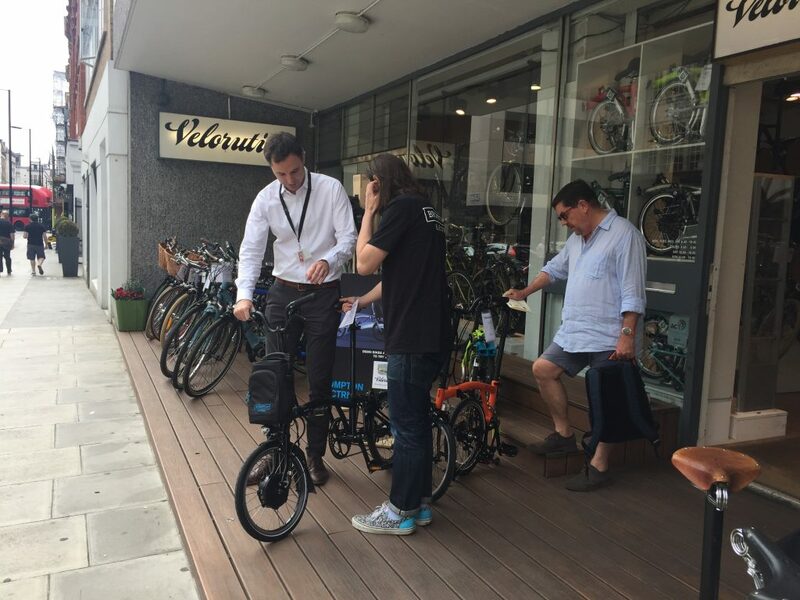 We bought two British made Brompton folding bicycles. We live in a small at so the bikes fit perfectly in our closet. 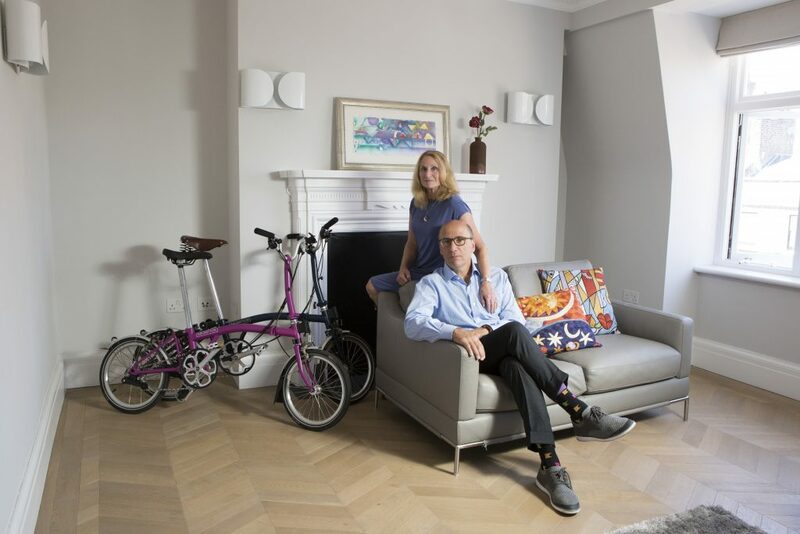 The Brompton bikes make our cycling life so easy especially around the city on weekends. Biking is a great way to stay healthy and see the world at the same time. It’s also a great thing to do as a couple because your spouse is never too far ahead. 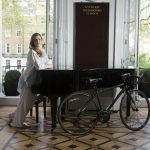 We work out regularly and ride our bikes a couple of times per week - Regent’s Park is a great place because there are no cars early mornings and weekends. We have biked together in the mountains of Colorado, taly, Spain, Croatia and Canada. We originally hail from Minnesota and there is nothing better on a spring day than riding around one of the 10,000 lakes. Our favourite rides in London are to Richmond Park and Wimbledon or along the canals, trying to avoid all of the walkers. I am currently finishing my masters degree in vehicle design at the Royal College of Art. My main area of work revolves around interior vehicle design and how we might encounter the much talked about level five autonomy, from a interior point of view. s er this summer, I hope to commence work in the automotive industry but location and company are yet to be decided. I consider myself passionate about anything industrial design, whether it’s typography, branding, products or vehicles. My main reason for loving design is the openness and creativity, and I am constantly amazed of how we surround ourselves with design everyday everywhere without even thinking about it. Coming from Norway, I also love spending time outdoors whether it’s on skis, running, swimming or with a tennis racket in my hand. I have been a cyclist since the beginning of elementary school. We even had a bike test that everyone had to pass for permission to ride their bikes to and from school. I did have a gap in my cycling years, once I purchased a Vespa and then later on for my motorbike license. Now however, having lived in London for two years, I wouldn’t trade my Schindelhauer for anything. 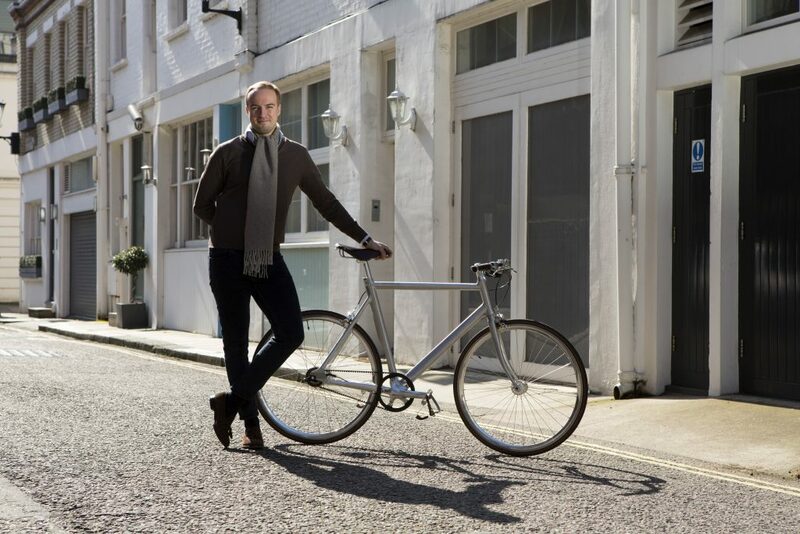 My Schindelhauer Ludwig VIII in the pure aluminium finish is the bike of dreams. remember seeing this on the wall with in a bike shop back home in Oslo, and I fell in love with it straight away. I remember thinking to myself, this is so awless that might actually consider biking in London. I have also fitted it with the matching leather toe clips and the Continental Grand Prix classic tyres with brown detail. The freedom and peace. 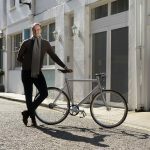 With the carbon belt drive, the Schindelhauer rides incredibly steady and quietly. 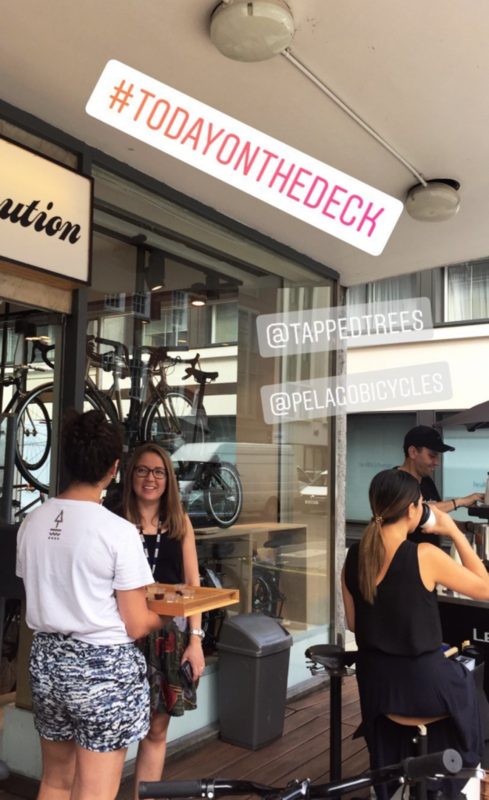 When it’s actually nice weather here in the London, the city opens up and being able to catch the breeze in your face in a congested and packed metropolis makes biking the best investment ever. Cycling is also quicker than any other transport in London, and you burn some mean leg muscles hehe! I try to cycle as much as possible, yet I feel limited by really wet weather and try not to provoke an incident by going out in windy, slippery London traffic. I’m a School Administrator in a London Prep school but I’ve also trained as a yoga teacher and am currently training to be a Cranial-Sacral Therapist. I love to travel. I’ve been lucky enough to live in a few different countries and travel quite extensively around urope and ssiao South smerica is next on my list. Unfortunately once the travel bug hit me it only seemed to get worse, every time I go somewhere it seems that there’s more to see and do. Not very long! I mean I’ve always loved cycling and rode a lot as a child but I’ve only started ‘properly’ cycling this year. I broke my foot very badly about 18 months ago, I had to have two operations and was on crutches for about 6months. At the beginning of the year a colleague suggested doing a London to Paris bike ride for charity and I thought training for that would be a great way to get my fitness back and also accomplish a real personal challenge for a good cause. A Trek Lexa road bike, she's very pretty! Cycling always puts a big smile on my face. It’s such a great way to start and finish the day, you not only get to where you need to go (avoiding the tube) but get a great workout in as well. At the moment I’m commuting to and from work and then trying to get a ride in at the weekend, the London to Paris ride was at the end of June so my cycling has increased quite a bit! I love going down the canal tow paths early in the morning, there’s so few people out at that time of day so it’s a great opportunity to take more notice of nature and my surroundings, there are lots of birds swimming in the canal. I saw a family of moorhens and a family of swans, very cute. It’s a completely different story on the way home though, far too busy, I’d almost prefer to stay on the roads! 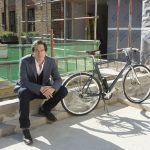 Director at Morrow + Lorraine Architects. My occupation is Architect but what I do for a living is help realise people’s aspirations through design. Architects are fundamentally problem solvers – sometimes that requires us to work out if there is a problem, define what it is and get people to agree that it needs fixing. Sometimes the hardest part is working out what the questions are, before thinking about the answers. I’m passionate about design which is a bit like saying I’m passionate about oxygen because design is everything, but I do really love working with people on buildings and occasionally when a “what if we did this…” moment occurs which blows everything into something new, fresh and exciting, think to myself yeah this is good. The project where this photograph was taken is a housing development that we designed for the Howard de Walden Estate. We lead a very talented and committed design and delivery team all involved in a huge team effort to create highly desirable ats for rental. It was September 2006 and I was at an architecture conference when one of the speakers said, “I’m cycling from London to Cannes and am looking for adventurous souls to join me.” I think from that moment I became a cyclist. A Schindelhauer Friedrich in midnight blue. I love the convenience of getting around town quickly and without fuss that cycling offers. iding in the city brings me joy as it peps me up before work and chills me out a erwards. Bimbling about town on two-wheels, get to see stuff that I’d otherwise miss out on. Be it a posh restaurant, trendy event or the most up-market party I always get to park my bike right outside the front door. I’ve done a gazillion laps of Regents Park over the years. You would think doing something over and over again would make it boring but I still love it. I think it’s because I always bump into a friend there. I am a Restaurateur & Hotelier. I have been in business with Chris Corbin for over 35 years. During that time, we have created, opened and developed some of London’s most iconic and best-loved restaurants. Along with the opening of The Beaumont hotel in 2014, Café Wolseley in June 2018 and further ventures on the horizon. I have cycled since I was four years old but only started to cycle seriously twenty years ago. A classically styled Pelago Bristol from Finland. 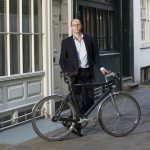 I have three bikes including a road racer, an off-road hybrid and the Bristol that replaces my previous ‘work bike’ – I needed something classic upon which I wouldn’t look incongruous in a suit! Work wise: speed and guaranteed arrival times. Leisure: solitude, escape and fitness. 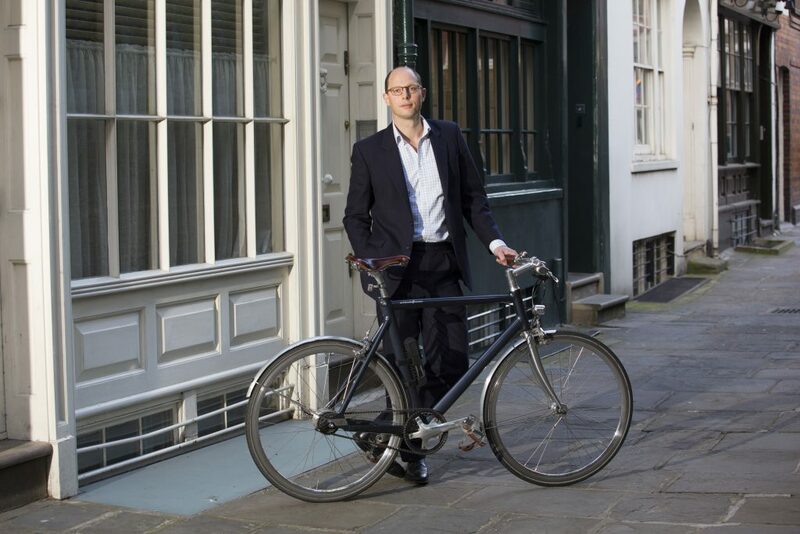 I ride the Bristol bike most days for business – just as I also drive, coincidentally, my Bristol Car. 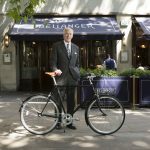 I try to vary routes whenever I can – through London, the older the better – leisure wise through Richmond Park and into the Surrey Hills. I’m a former two time Olympian for Team GB in short track speed skating. I was an elite athlete for 13 years and now transitioning into married life and a future career. I’m currently a Personal Trainer at David Lloyd in Nottingham and proud to have been accepted as a fire fighter. I had so much help and support to get to the top in sport - from my team, family, friends and community, that I am passionate about giving back and helping people reach their own goals or keeping them safe. I tend to throw myself into sport at the deep end, I love trying new things and pushing my limits, so not surprisingly I am super competitive from racing on the track to playing rock, paper, scissors. How long have you been cyclist? 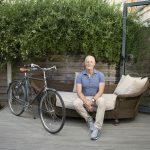 I have always been a keen cyclist because it was the best way to improve endurance and build my aerobic base needed to compete in skating. What bike are you riding and why? I came across scootering just before the Sochi Winter Games 2014, when I was in touch with Swi y Scooters via twitter. t then became a way to recover in between the vigorous training. I would have my Miniature Schnauzer Daphne on a harness enjoying pulling me along so that we both got the benefits. My favourite scooter has been the Swifty One folding scooter which is super handy for hopping on and off trains and trams. Plus it just looks great- I love the big wheels and fresh colours. What appeals to you about scooting? It’s great all-round. I use it as a fun way to train or commute. Makes life easier and quicker to cut across town saving me valuable time. How often do you scoot? 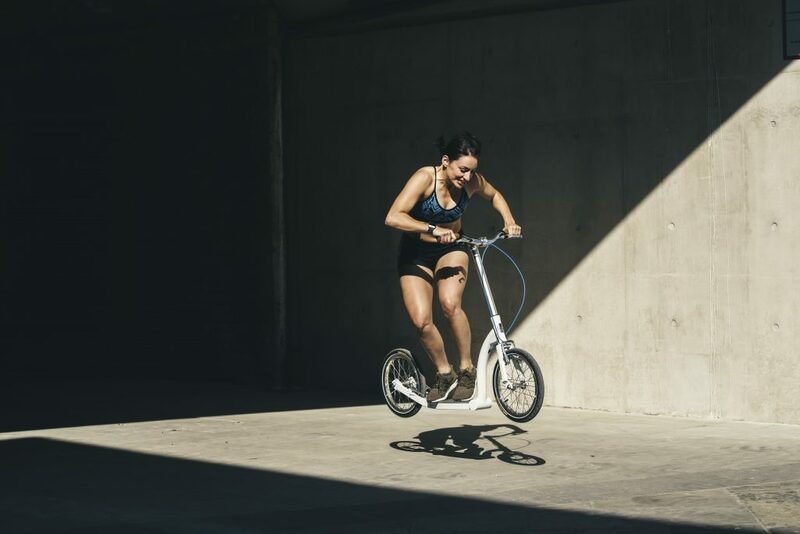 I scoot most days for the convenience of saving time and burning those extra calories in a fun way without thinking or working too hard. What’s your favourite route or destination? I tend to go on long rides in the Nottinghamshire countryside at the weekend as I’ve found this really clears my mind or simply commuting across the city to work. I also enjoy going to Colwick Country Park where Daphne loves going in and around the lakes.